Weeks of searching for this wine review and still MIA. This is why I prefer handwriting my reviews before typing. Handwriting feeds my obsession with hard back journals and stationary. Writing is exhilarating: seeing your thoughts on paper, hurried penmanship from words spilling out and your hands not being able to keep up with your thoughts. The downfall is deciphering your handwriting then wishing you used a voice recorder:). Another great thing about writing out your thoughts is when the friggin computer has a glitch you do not lose any work. You then find yourself searching for hours and days because your original thoughts were so magnificent that there is no way they can be recaptured. 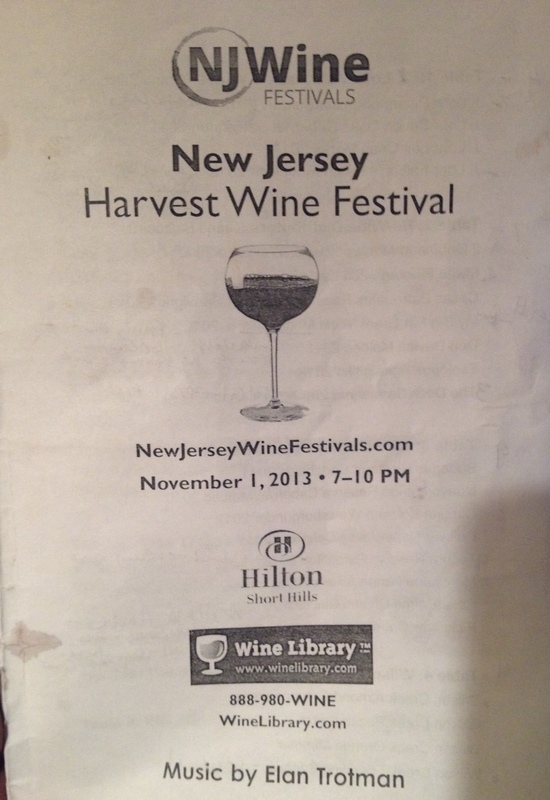 The Professional and I are on our annual trip to the New Jersey Harvest Wine Festival at the Hilton, Short Hills, NJ. We developed a game plan to taste as many of the 100+ wines without becoming intoxicated. Ok, we all know there will be some level of intoxication; however, as classy wine drinkers, the level of intoxication should not be one that leads to regret. (Just a little advice 🙂). There are over 140 wines and I tasted approximately 41 wines, which are identified below. The key to tasting 40+ wines and not get drunk is DON’T SWALLOW! For those of you who see this as a sinful act, trust me, there were wines that deserve to be at the bottom of a spittoon. J. Lohr Falcon’s Perch Pinot Noir 2013 – cherry and spicy aromas, juicy, cherry flavors, Delicious! No surprise, I like this wine, J. Lohr produces great wines. My Big Fat Greek Wine Moschofilero 2012 – variety: Moschofilero, reminds me of Albarino, fruity. Delicious! Look what reared its ugly head: For those of you who read my previous blogs. 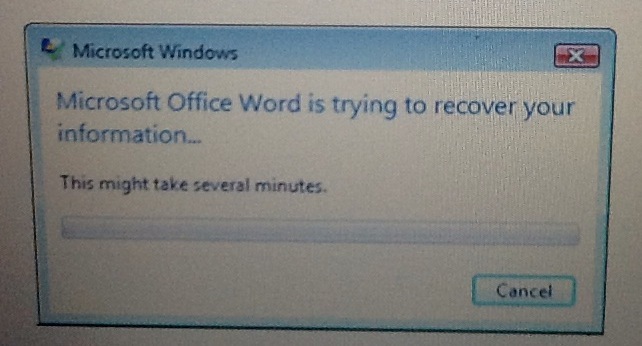 This is not the first time I had issues with my computer. 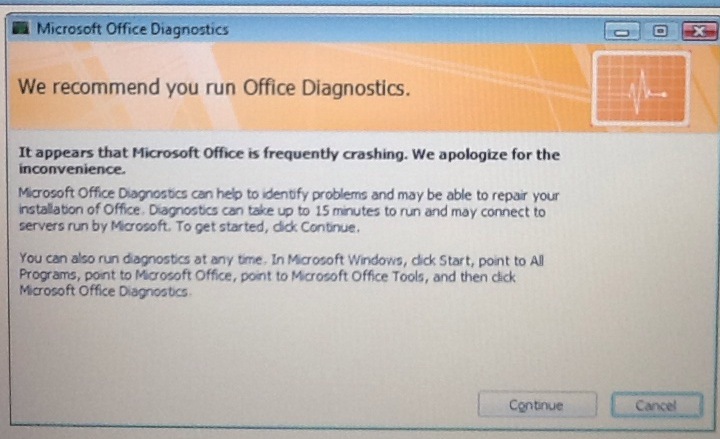 In January 2014, it took Best Buy’s Geek Squad a month to fix the problem; apparently, the problem still exists. Hope the saying, “third time’s a charm” is true. We love Pinot Noirs so we had to try the Tecora Reserva Pinot Noir 2010 from Chile, silky smooth finish – Good! Alma Andes Cabernet Sauvignon – Big licorice and oaky aromas, full-bodied berries and woodsy flavors – Get’s a Star! We wanted to taste more wines at this table, but the people waiting were 3 rows deep, so we moved on. Wilson Creek Almond Champagne – Okay. Wilson Creek Sparkling Sangria – reminds me of Chrysalis Vineyard’s Sarah’s Patio Red. Yummy! Pinot Patch Pinot Noir California 2012 – caramel and smoky aromas, fruit-forward, medium to full-bodied with a smooth silky finish. Gets a Star! Taylor Cellars Pinot Noir “Michaud” Monterey County 2009 – fuller bodied than the Pinot Patch. Delicious! Fondo Antico Grillo Parlante Sicilia IGT 2012 – variety: Grillo. Reminds me of a Verdejo. Light, pale in flavor. Interesting. Cazar, Chardonnay Russian River 2011 – 100% stainless steel. – Tasted to cleanse palate from the Black Kite Pinot Noir. Okay. Lopez de Heredia, Tondonia Reserva 2001 – Rioja – Nice! Last year, they were at the festival and wines are delicious. No tasting done this year – exploring new wines of interest. The Naked Grape Pinot Noir – HORRIBLE! Enough said! Pico Maccario Lavignone Barbera D’Asti 2011 – Dry Sparkling Red – Tasty! Hoopes Hoopla Chardonnay 2012 – All I taste is chemicals. I do not know what is going on… JUST HORRIBLE! Recougne Sauvignon Blanc – After the last two wines (minus the Asti), this was pleasant. Poggio Almino Cabernet Sauvignon/Merlot – Full-bodied spicy red blend. Thank you, Jesus, a good wine! I could not take another “unpleasant” wine. There were other tables of foods, but Alexian stood out from the others. The Chicken Liver Mousse and Rosemary Pate were YUMMY! 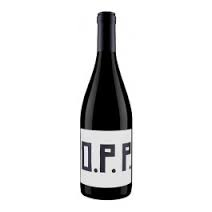 Mouton Noir OPP 2011 – Big cherry flavors. The best Pinot Noir I tasted thus far. VERY GOOD! Terlano Pinot Grigio 2012 – pale in flavors – light. Farina Amarone 2010 – Of course, I had to taste the Amarone and I’m glad I did; candy apple and BIG herbal aromas with cherry and earthy flavors. I LIKE IT! 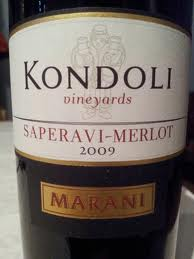 Accordini Valpolicella “Ripasso” 2010 – deep rich color, wet musky aromas, medium-full bodied. Okay. Tenuta Monteli Caburnio 2009 – No notes are written, so it safe to assume that I’m becoming numb and the wine was not impressive enough to write tasting notes. Therefore, I coming to the conclusion that I’m “not able to appreciate it at this time”. Otto’s Constant Dream Sauvignon Blanc 2013 – Big grapefruit flavors, typical Sauvignon Blanc. Nice! We have now entered the Livingston Room; we should have started in this room. Wyatt Cabernet Sauvignon California 2012 – Smooth. Delicious! 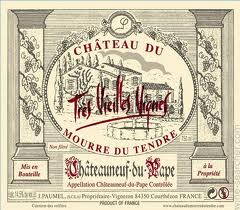 Mourre du Tendre Chateauneuf-du Pape Tres VV 2007 – AWESOME! Roagna Barbaresco Paje 2007 – Good! Sean Minor Cabernet Sauvignon Napa 2010 – I love Sean Minor wines, but the Cab was not available. 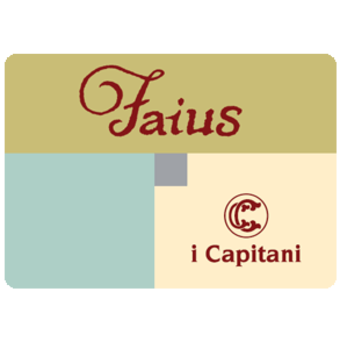 I Capitani Faius 2010 – Three different varietals. Very complex. I’m intrigued! Vicien Malbec 2009 – smoky flavors. Nice! La Lajania Chardonnay 2012 – 100% stainless steel, pale flavors. Ok! My wine purchase resulted to: “No, we don’t have that one” and “no, we don’t have that one either”. I hoping this wasn’t going to happen again, which is why we arrived early. During the event, I asked, “Does the Wine Library have your wines and was told yes. The Wine Library could have ordered and shipped me the wine, eh; and that quick our wine weekend was over. See you next year, Short Hills.